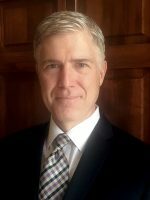 Speaking on the Senate floor Thursday morning, Senate Minority Leader Chuck Schumer (D-N.Y.) said he has come to a decision about the nomination of Judge Neil Gorsuch. “After careful deliberation, I have concluded that I cannot support Judge Neil Gorsuch’s nomination to the Supreme Court,” Schumer said. “His nomination will have a cloture vote. He will have to earn 60 votes for confirmation.